﻿ Following the recent outburst from The Dickies on Warped Tour, there’s been much debate about whether punk has lost its edge, or whether it’s become compromised with the onset of a more tolerant, PC culture. The solution really boils down to how punk as a scene is viewed, not just the anti-establishment rhetoric as it’s often viewed, but a place of solace for those embracing the counter-culture. Ultimately, it’s an issue of how a scene takes care of its own, not one of what can and can’t be gotten away with. On Live Life Like A Tourist, Fights And Fires clearly understand that. They’re really obliged to, given that this is the sort of lean, punchy punk album that puts enormous populism as one of its key factors. It helps that Fights And Fires are really great at it too, only held back from true excellence by an unfortunate lack of diversity among eight tracks, but still with the energy and hunger one would expect from a punk band of this calibre. Anyway, the lack of diversity here isn’t so much a great hinderance as much as it’s a feature. There’s a lot of The Bronx in Fights And Fires’ DNA, and if emulating their raucous, frothing-at-the-mouth punk was the end goal, they could’ve done much worse than this. Apart from closer Ouija Board which pares itself back to a single, gruff guitar, the rest of these eight tracks carries the firepower that’s imperative for great punk, whether that’s the burly, whiskey-soaked swagger of Take A Swing At The World, the pickup into double time on Awkward, or simply the big, driving melodies of Blanquettes Avenue which, with a bit more refinement and polish, wouldn’t be that far from a Foo Fighters track. And while it does all circle back to a case of hero worship (topped off by Philip Cox’s bullish howl of voice), Fights And Fires have captured the essence of their brand of punk almost perfectly, and it would be hard to begrudge them of that. Of course, framed alongside the lyrics here, the feeling of defiance and uplift carried in the music is amplified to even greater degree. It also sheds a bit of light on what that album title could mean, namely about taking a break from all the bad that life throws and just finding some enjoyment. The fact that’s the exact sentiment of Take A Swing At The World only makes this more apparent – the world might hit back, but you just need to take it in your stride and hit even harder. These worries do form the underlying notion of Live Life Like A Tourist on Hard To Dream and Kibosh, with the stresses of being away from loved ones on tour and grinding away at a monotonous day job in order to fund the life of a band addressed respectively, but compared to the big emotions overshadowing Cox’s worries on his wedding day on Church Bells, or the solidarity towards the outcasts on Awkward (which is probably the most genuine attempt at this sort of track in a long time), there’s a notion of inclusiveness and big-hearted yet pragmatic positivity that really sets them apart. By that reasoning, there’s very little to fault with Live Life Like A Tourist. For a svelte punk album that never outstays its welcome, Fights And Fires manage to pack a lot into it, and it’s impressive how much of it actually really sticks. More importantly, it’s the sort of definitive statement of punk’s inclusiveness that’s really needed right now, both in terms of sound and lyrics, and doing so in a way demanding to be counted and refusing to be ignored. This is one definitely worth checking out for modern punk fans; Fights And Fires mightn’t be revolutionising the sound, but they’re approaching the top tier of bands doing it. 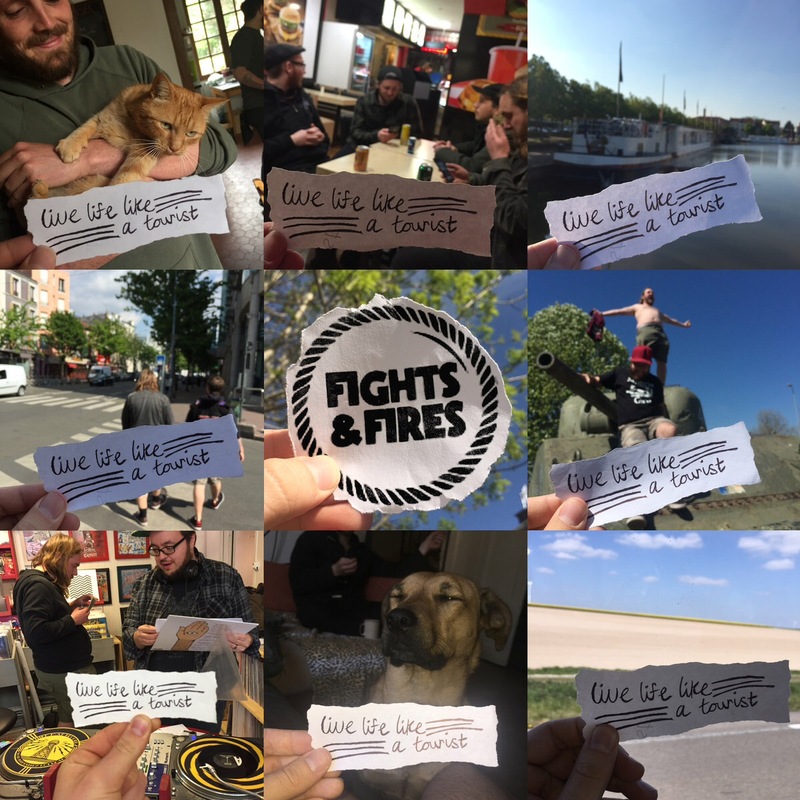 ‘Live Life Like A Tourist’ by Fights And Fires is out now on Lockjaw Records.